Most people that build race cars will start with a somewhat modern, familiar platform, with a solid aftermarket, and the potential to be fast enough win whatever it enters—provided the driver is up to the task. Some others would rather blaze a trail of oddity and stubborn individuality, and end up with something that meets their atypical standards of fun, at the expense of some of those traits of your everyday race car, like speed, practicality, and reliability. We suspect that anyone who is willing to build a Model T-based race car falls into the latter category, and does so with a guffaw. 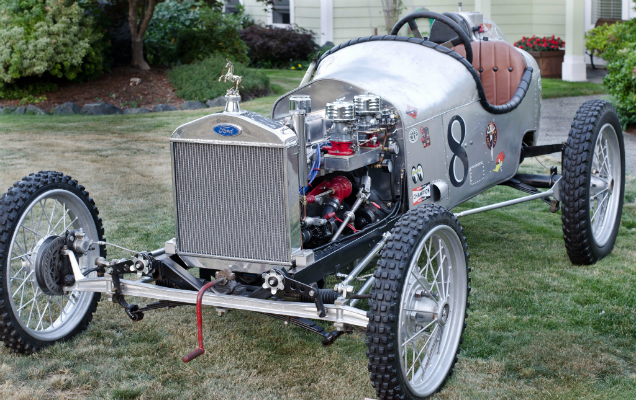 An auction listing posted to Bring A Trailer offers up one such example, an open-topped 1927 Ford Model T, composed of equal parts absurdity and ingenuity, with parts sourced from manufacturers around the world. 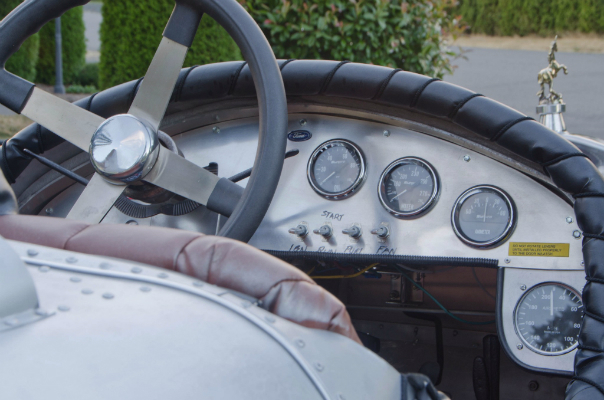 The body is of bespoke handmade aluminum, and the frame is a modern reproduction of the car's original frame, which was bent in an undisclosed fashion—probably a crash. 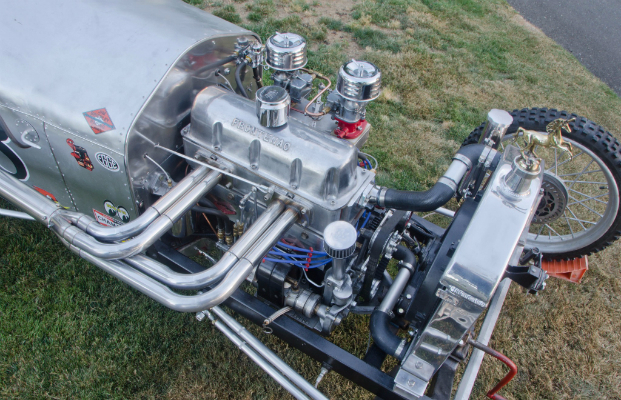 The engine, originally 189 cubic inches, was bumped up to 200 cubic inches with a modified crankshaft from a Ford Model A, and the head is a Chevrolet overhead valve design. 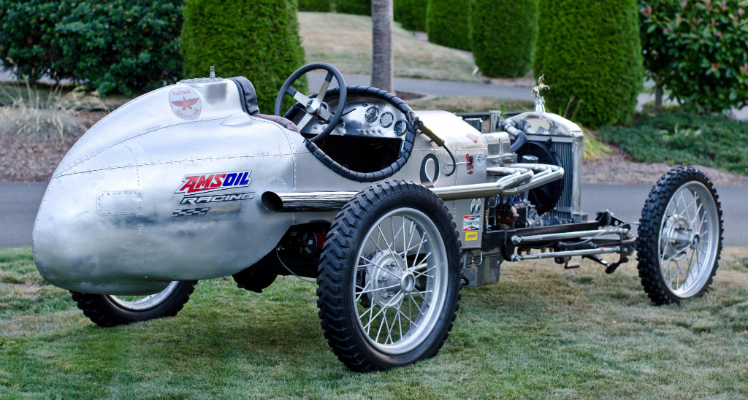 The camshaft, too, is a modified Model A part, and the oil pump is from Volkswagen. The flywheel is a native Model T part, but like everything else, it has been modified and lightened. The seller estimates that the engine produces around 150 horsepower. The brakes are from a Kawasaki Ninja 600 sport bike, with pressure provided by a Wilwood master cylinder, they are a major upgrade from the Model T's factory braking system, which was a single drum brake mounted to the transmission. The steering has been upgraded to rack and pinion, too. Further information on the car can be found in the car's listing on Bring A Trailer, where potential buyers can place their bids. Know that you're bidding on a plateless race car trapped on an island in Canada, though. With how cryptic the Model T's pedal system is, interested parties may want to brief themselves on how to drive a Model T before placing a bid. Regular Car Reviews shows below how it's done. We think it looks tricky enough to drive on the road; managing this system in a race is all but unfathomable to us at The Drive.